Former Mozambican Finance Minister Manuel Chang could be extradited to the US or Mozambique in connection with financial crimes. Chang is expected to hear his fate in the Kempton Park Magistrate's Court on Tuesday. According to a report, Chang was arrested in South Africa on December 29 on a warrant from the US, where he is wanted on allegations of conspiracy to commit fraud and taking millions of dollars in bribes in a $2bn loan scandal. South African prosecutors formally filed the US extradition request in a Johannesburg court on February 5, the report stated. The Department of International Relations and Cooperation also later confirmed receiving an extradition request from Mozambique. Earlier this month, Chang was denied bail in the Kempton Park Magistrate's Court. He argued that his detention was unlawful and that his extradition, if carried out, would also be illegal. But Magistrate Sagra Subroyen said releasing him would undermine SA's criminal justice system. The magistrate also said there were some months where there was no movement in Chang's bank accounts and questioned "how he went about his living". Subroyen said Chang failed to prove beyond reasonable doubt that he was a suitable candidate for bail. "The applicant is a person of influence and may very well have his way in returning to his home country, despite his travel documents being handed into relevant officials," said Subroyen. 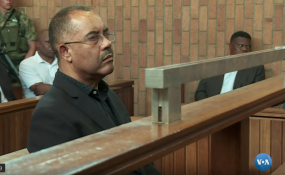 The Kempton Park Magistrate's Court is expected to decide on Tuesday whether he will be extradited.